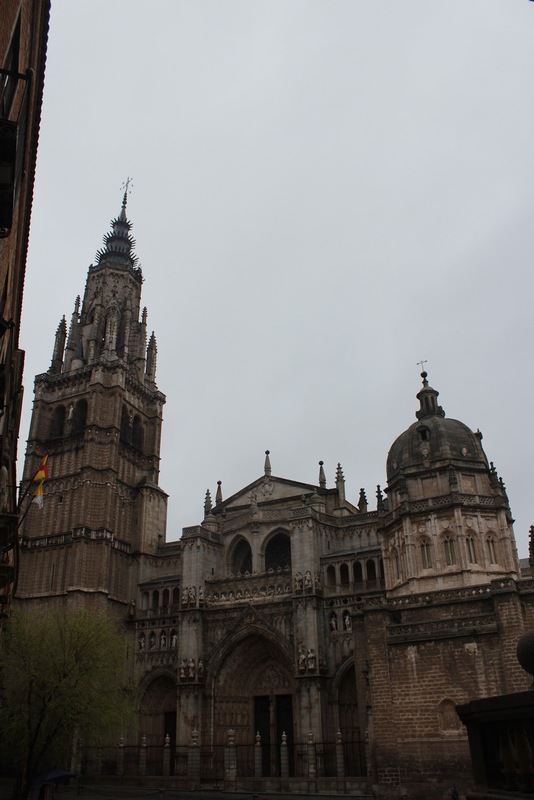 Dad and I took a day trip from Madrid by train to Toledo. It was a short train ride, plus a quick cab up the hill to the old city. The first thing that struck us were the medieval walls around that part of the city It just felt so old... you could feel the history. The streets were winding and covered with cobblestones (no buses allowed! ), and the walls were close to you. It was labyrinthine. We spent most of our time at the Gothic-style cathedral, considered the greatest example of this type of architecture for a cathedral in Spain. Its size was impressive, as well as its history; like many cathedrals, it was built upon the site of the city's former mosque. There were also three synagogues; the religious history in every Spanish city we visited really struck me. You have a mixture of architecture from so many sources, from Moorish arches to motifs featuring the Star of David. You can't deny that this melting pot of religion and culture is what created such a unique Spanish culture. We also stopped by the Iglesia de Santo Tome to see El Greco's painting, The Burial of Count Orgaz. I found that visit to be a little disappointing. The space was very small, and I think I would have enjoyed the larger El Greco museum rather than the single painting. It started raining on us, so we ducked into a cafe for some chocolate con churros. Now, I need to discuss this Spanish favorite! There are so many places in Spain to sample this traditional treat, hot chocolate (very thick, almost like a pudding!) with churros (not the sugar-covered kind we have in the U.S.). You basically dip the fried churros into the chocolate; they seem like an unlikely pairing to me, but together they are heavenly, especially on a chilly and rainy day. The trip to Toledo was well worth the journey! We loved the shops with the famous swords and marzipan, the view from the city walls, and the overall feeling of the place. It just seemed so old and full of history; we really enjoyed our time there.